Here you can find out the current work of JDA. Read online reports and publications. Simply select from any of the links in this section. JDA has been present in Northern Afghanistan for 15 years, with a strong specialty in high quality agricultural interventions, concentrating on the development of more resilient, sustainable, annual cropping in marginal and more commercial environments of northern Afghanistan. Reaping frequently represents more than 30% of total wheat production costs. Previous USAID projects that have made reapers available to farmers have demonstrated cost reduction to less than 10% of total costs, which has a major impact on profitability of wheat farming. The current problem in northern Afghanistan with “certified seed” is the farmer’s lack of confidence in it. The high price of a 50 kg bag out prices many farmers. Seed companies have almost exclusively sold seed to large distribution programs and have not established farmers as clients. The Purdue Improved Crop Storage (PICS) project aims to increase the income of farming families in northern Afghanistan through the use of plastic grain-storage bags. Our objective is also to improve food safety, retain crop’s nutritional value and reduce post-harvest loss. Weed control training is done under the project grant of RADP-N in four provinces; Baghlan, Jawzjan, Samangan, and Balkh. The goal of RADP-N training is to increase wheat productivity by 25% for 85,000 farmers. More	than	7,000	farmers	have	been	involved	in	more	than	34,000	trainee	days	over	these	three	years(2010-2013),	bringing	more	than	17,000	ha	into	improved	cultivation	and	returning	an	increased	2,249,681	USD	per	year. JDA International is expanding its reach of an exciting and innovative agricultural method to rice growing, called System of Rice Intensification (SRI). SRI is a farmer innovation approach to improving rice production which started in Madagascar almost 30 years ago, and has spread since through 42 countries including Afghanistan in 2007. JDA began research in melon fly control on 36 hectares of farm land across three provinces of northern Afghanistan. The results showed that farmers were applying highly toxic insecticides frequently and typically with poor control. For some young boys in Kholm, a village in northern Afghanistan, this was not just another day at school. The tractor demonstration was coming to town. The boys left school and walked to a nearby field to meet their fathers to see how this new farming equipment works. 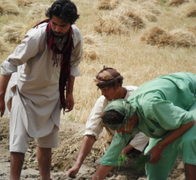 JDA is continuing its agricultural research in northern Afghanistan. IFDC’s FARMS project is underway in Afghanistan to provide farm trials with a variety of crops including watermelon, cucumber, tomato, flax, sesame, and sunflower.